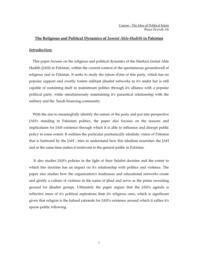 This paper focuses on the religious and political dynamics of the Markazi Jamiat Ahle Hadith (JAH) in Pakistan, within the current context of the spontaneous groundswell of religious zeal in Pakistan. It seeks to study the raison d'etre of this party, which has no popular support and overtly fosters militant jihadist networks in its midst but is still capable of sustaining itself in mainstream politics through its alliance with a popular political party, while simultaneously maintaining its parasitical relationship with the military and the Saudi financing community. With the aim to meaningfully identify the nature of the party and put into perspective JAH's standing in Pakistani politics, the paper also focuses on the reasons and implications for JAH existence through which it is able to influence and disrupt public policy to some extent. It outlines the particular puritanically idealistic vision of Pakistan that is harbored by the JAH, tries to understand how this idealism nourishes the JAH and at the same time makes it irrelevant to the general public in Pakistan.